We all admire the altruism of a Mother Teresa or the heroism of people who risk their lives to save a drowning child. But when it comes to our own everyday lives, we tend to regard “looking out for number one” as more central to human nature than reaching out to others. Surprisingly, though, that cynical view does not hold up in the light of recent research. In this lively book, Alfie Kohn draws from hundreds of compelling studies in psychology, sociology, economics, and biology to demonstrate convincingly that we are more caring than we give ourselves credit for, and that our generosity cannot be reduced to mere self-interest. 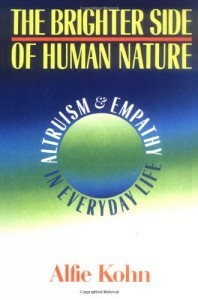 The Brighter Side of Human Nature shows that helping is every bit as natural as hurting. 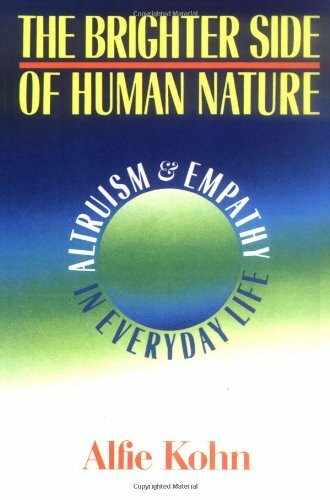 To make this case, Kohn artfully weaves together insights on topics ranging from the nature of empathy to the causes of war, from our tendency to blame our behavior on our genes to the importance of understanding evil from the inside. He explains why humans cannot be described as innately aggressive and suggests that our understanding of morality may be transformed by this new view of our species. Along the way, Kohn accounts for the curious attraction that a darker world view seems to hold for us. He also refutes much of the conventional wisdom, debunking, for example, the notion that women are inherently more altruistic than men, and showing how children’s generosity can best be promoted without using rewards. Rigorously researched and engagingly written, The Brighter Side of Human Nature offers an informed optimism that asks us to reconsider what it means to be a human being. “A vastly informative, closely reasoned yet very readable book. “A masterpiece — engaging, reasoned, provocative, and a joy to read. Kohn’s hard-headed good news is precisely what we need to make our way into the 21st century.